I love quizzes. Most weeks I meet up with friends to try our luck at the local pub quiz. There's usually a music round where the quiz master holds his microphone up to his little tape recorder and plays us songs that we then have to name. More often than not I'm ashamed to say we've never heard of most of the songs, our team knowledge limited by having not been alive in the 60's and still in nappies in the 70's. Occasionally we get lucky, last night we came fourth. Last week I posted a trivia question on this blog but got no response so I thought I'd give it another go. 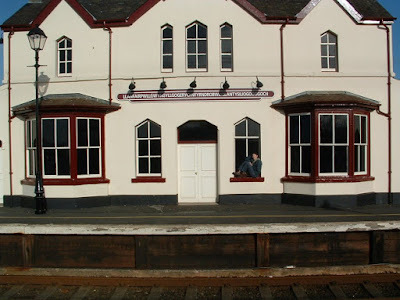 In the photo below, I am sitting in the window of a train station in North Wales. What connects this train station with Yeasayer ? OK, here's the sign in close up and yes, it is a real, it's the longest officially recognized place name in the United Kingdom and one of the longest in the world. I purchased my wedding dress there (not at the station of course). The first person to respond with the correct answer will be entitled to hearing me saying the full name of this station in Welsh once should they ever bump into me.